We are proud to partner with companies that are not only great products but have great people behind them. We believe in the value of the products they are selling otherwise we would not be partnered with them. 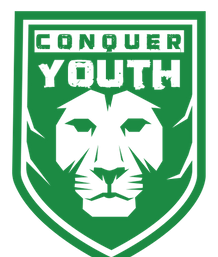 When possible we also ask for a code to share with fans of Conquer The Gauntlet and its associates. 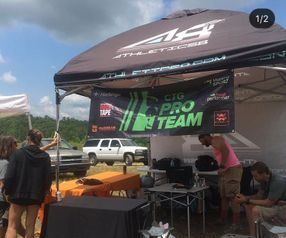 Don't forget to tell them the CTG Pro Team sent you! 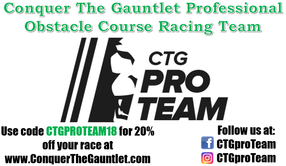 Use code CTGPRO19 for 20% off your registration to Conquer The Gauntlet individual races (elite or open). Use code WARNKY for 10% off your order. Don't forget to check out the "Deals of the Day" section so you can add some FREE climbing holds to your order. You need a dryrobe and here's why, plus a review of the world's most advanced changing robe. Order yours here and don't forget to customize it with your favorite race or logo and name. Use code CTG10 for 10% off your order every time. 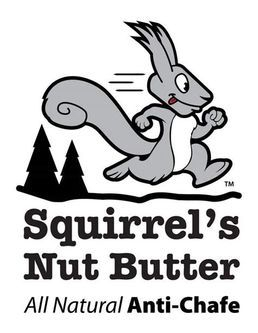 Run without any chaffing thanks to Squirrel's Nut Butter. Great for anywhere you have skin touching skin or the possibility of a blisters whether you are training, racing or running Conquer The Gauntlet's multi-lap Continuum. and new for 2019 Beet Performer with Pineapple! Use code CTGPROTEAM20 for 20% off your order. Want to know more about Marena Sport compression, read this Mud Run Guide article. Order your Harbinger weight vest, thick bar grips and dip/pull-up belt here. 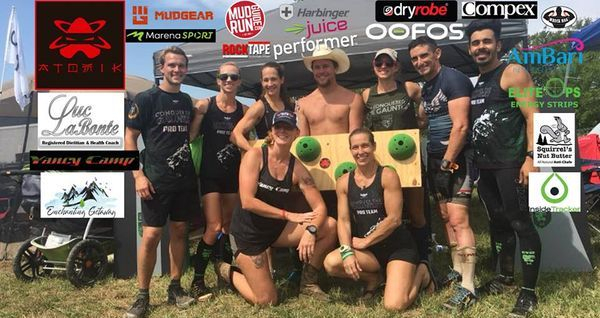 Curious about Compex specifically for use in OCR, read this Mud Run Guide article. Then order your Compex EMS here. Want to know about using OOFOS to recover from OCR and Ultra-OCR. Then order your OOFOS sandals, slides and shoes here. 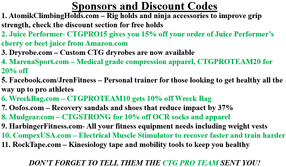 Use code CTGSTRONG for 10% off your order. Order your MUDGEAR socks, shirts and gloves here. More than a tape company, a movement company. 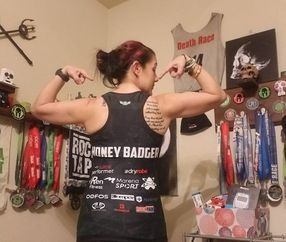 Read about RockTape and why you should get someone in your group certified in this Mud Run Guide article. Order your RockTape and movement tools here. Get the training weighted bag used by the OCR World Championships and North American OCR Championships. Their weighted bags are filled with rubber pellets, which means they don't get heavier when they get wet. Plus, they are super durable and are capable of handling whatever rough conditions OCR athletes try to throw at them. Order your Wreck Bag here. 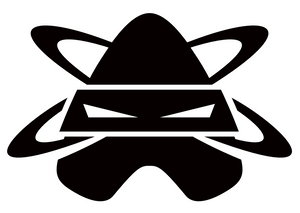 There's only one website to go to for all the latest and most accurate OCR news, Mud Run Guide. 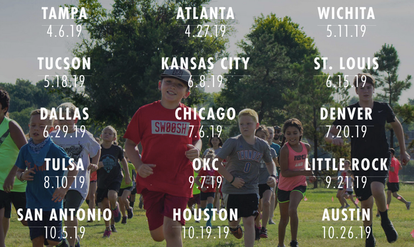 Plus, they have the largest selection of race discounts. Race often, use their codes and save a ton of money. Book your travel through Nicole Willis at Enchanting Getaways, LLC. $20 off HYLETE apparel, bags, clothes and accessories. 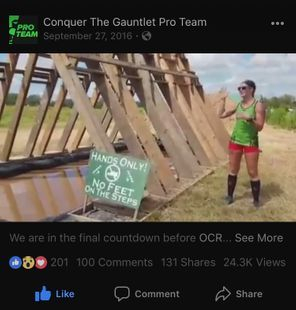 Interested in sponsoring the Conquer The Gauntlet Pro Team? Reach out to us via the contact form on this website or by emailing evan@ctgproteam.com to hear about the cost and benefits.